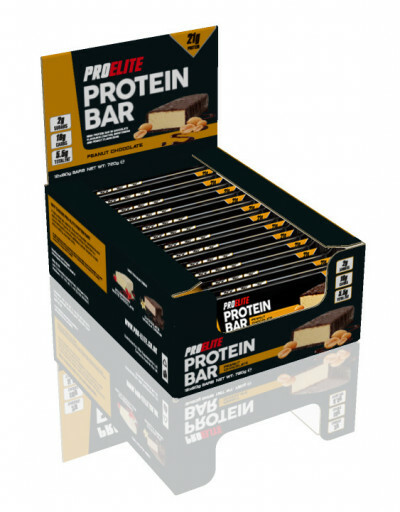 Pro Elite is raising the bar with their delicious new Protein bar. Every bar has 21g of protein, is high in fibre but has very low simple refined sugar. Making this an ideal choice if you want to stay within your macro’s but enjoy a high Protein, great tasting, low calorie bar. Feel like you’re cheating but not have the guilt! Protein Blend (Milk Protein Isolate, Whey Protein Concentrate (Milk)), Dark Chocolate Flavoured Coating (14%) (Sweeteners (Isomalt, Sucralose), Non-Hydrogenated Palm and Palm Kernel Oil, Fat Reduced Cocoa Powder, Emulsifiers (Soya Lecithin, E476)), Hydrolysed Collagen, Humectant (Glycerol), Fructo-Oligosaccharides, Humectant (Maltitol), Soya Protein Isolate, Wheat Protein, Water, Inulin, Rapeseed Oil, Peanut Flour, Barley Flour, Flavouring (Peanut), Sodium Chloride, Antioxidant (Natural Mixed Tocopherols). May also contain: Egg, Nuts. Can be used by people wanting a clean high protein snack, that is low in sugar and fits within your macro intake. It is important to maintain a varied and balanced diet and a healthy lifestyle.